Lock in a great price for Little Petra Bedouin Camp – rated 8.5 by recent guests! The staff was very helpful and friendly. The food on site was excellent and hearty. There is a sense of community amongst the other guests even though most stay for only 1-2 nights. Beautifully nestled in between the mountains. Great recommendations for how to enter the back end of Petra. I really loved this place. I initially planned to stay 1 night, but then I decided to stay 2 nights because it was very nice! The beds are really comfortable, the bathrooms are always clean, and the atmosphere at night is magical. After spending many hours walking around Petra, you really need a good rest! Waleed was always approachable and helpful, both before my arrival and when I was already there. I highly recommend staying here, as well as paying for the breakfast and dinner, they are really tasty and the price is excellent! The tents were cosy enough for staying in a camp. The staff were friendly and accommodating when they could be. The food was also good and worth including. Incredible location - the landscape is mind-blowing. The camp is simple, but comfortable... and you are just a few minutes walk from Little Petra. It was a great thing to do on top of Petra. Highly recommended. A great experience, especially when nighttime comes around. The cultural hangout tent was great and they go all the extra miles to take care of you and help you experience local Jordanian culture. 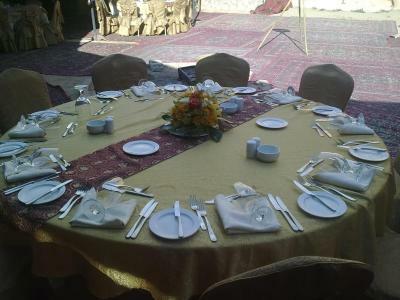 Located in Al Ḩayy, Little Petra Bedouin Camp provides accommodations with free WiFi and seating area. The luxury tent offers a continental or buffet breakfast. This property also has one of the top-rated locations in Al Ḩayy! Guests are happier about it compared to other properties in the area. This property is also rated for the best value in Al Ḩayy! Guests are getting more for their money when compared to other properties in this city. When would you like to stay at Little Petra Bedouin Camp? This tent has a private entrance, air conditioning and seating area. This tent has a seating area, mountain view and air conditioning. This tent features a private entrance, view and washing machine. This tent has air conditioning, private entrance and seating area. House Rules Little Petra Bedouin Camp takes special requests – add in the next step! Little Petra Bedouin Camp accepts these cards and reserves the right to temporarily hold an amount prior to arrival. Our tent did not have a key or safety deposit box however we did feel very safe. The food was ok, but not too special and there was no veggie option at dinner for the main course. we had to help ourselves with rice and potatoes and cooked vegetable as sidedish the tents could have been a bit bigger and shown on pictures in the camp description Besides the Shisha tent, where it was very smoky there was no place to be in the evening as it was too cold outside( Mid April). An Nonsmoking tent to hang out would be great the tents on the hill are not recommended for elderly people. It a bit steep to go there at night the water for dinner was given in oneway little plastic cups. too much plastic litter. Amazing place!!!! They are so friendly, educated and you feel like in home. I will be back many more times and of course I recommend anyone to stay there. The co-Ed bathrooms were a bit cramped. The only indoor lounge area was for shisha and it got very smoky. Breakfast could have been better only thing hot was hard boiled eggs the rest was cold lunch meets. Bring your own pillows. The pillows provided were very hard could not sleep on them. Water pressure low. Try not to stay on the hill after a while you get sick of walking up and down. Location was good not to far from Petra. It was a special stay with the most heartwarming hosts. We spent two nights and we’re really sorry to leave. We got the best recommendations how to visit Petra and the transfers got arranged easily. The food was simply amazing! They had a tent to hang out and meet the other guests if you wanted to. You got served tee and shisha and we even were invited to join the birthday of one of the family members. Really a memorable stay. Conveniently located and value for money. Food spread is decent and sufficient. My tent with single bed was very neat and clean. Malit and his staff were all very friendly and hospitable. There’s a big common tent where you can chat with your friends, listen to music, free flow of hot tea and shisha.